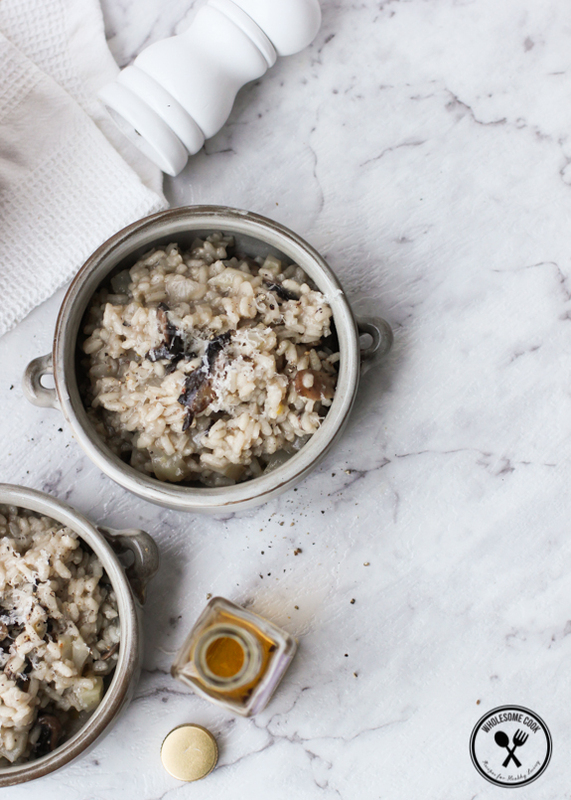 Risotto, when done right can be a truly comforting dish and is one of Matt’s favourites. Truffles? 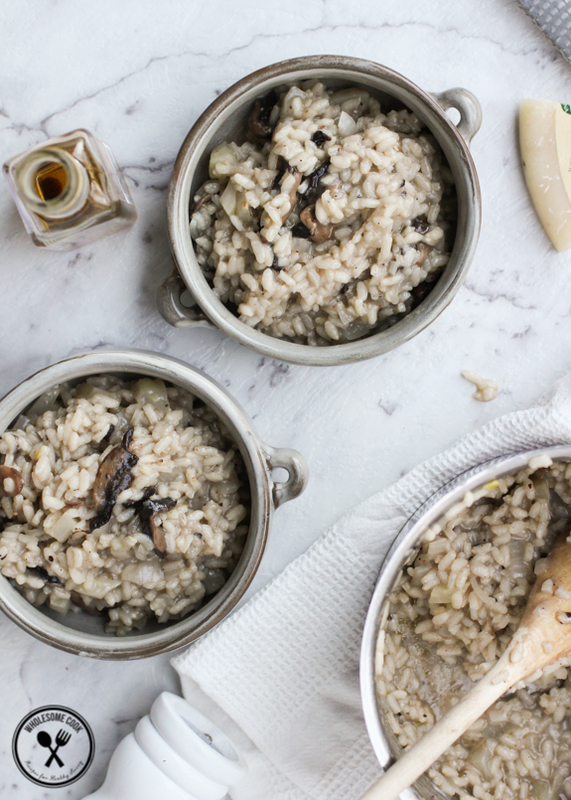 Don’t even get me started… Check out my tips for making the perfect risotto and an indulgent fennel, mushroom and truffle version to boot! 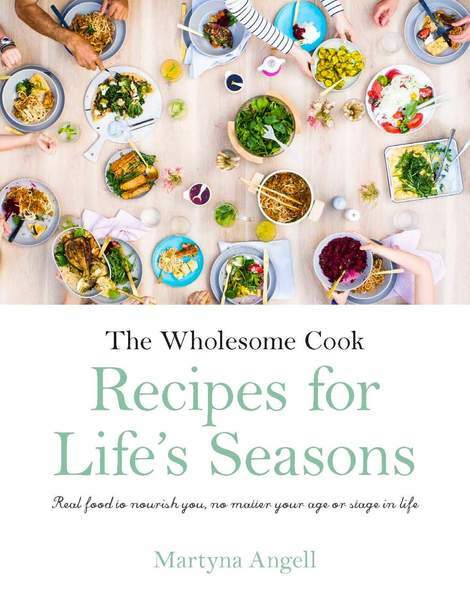 Includes vegan and dairy-free suggestions too. I’m not sure how you feel about Winter, but to me the season is all about snuggling up with a mango chai latte and comfort food. Our oven tends to work overtime in the colder months, roasting all matter of things. Medleys of root vegetables provide comfort and a good dose of seasonal vitamins, minerals and flavours. Admittedly, Winters in Australia are pretty mild. Except for this past week when a definite frostiness could be felt in the morning air. It snows, but only in the mountains. The rest of us are left to enjoy days that, especially for a couple of hours around midday, remind me more of Indian Summers with shorts and t-shirt weather. There are colourful leaves gracing footpaths and lawns everywhere. We get to eat hearty soups, roasts and puds. And, most importantly, we get to have truffles. What’s not to love? I must admit, I’ve never actually bought them fresh. I tend to go for real truffle infused oils (such as this or this) and this truffled cheese made with sheep’s milk and studded with slivers of white truffle. Fragrant and similar in texture and sharpness to traditional pecorino, it’s said to bring you under its spell forever. It’s true. I’m definitely hooked. It’s available from Formaggi Ocello here in Sydney. Because the sweet, heady flavour of truffles is so intense, a little goes a long way. Nevertheless, it was delicious. Creamy and flavourful, despite love-less stirring. I did manage to pay attention as to how the risotto was made and I’ve been using the same techniques in my kitchen, stirring perhaps a little more lovingly. 1. Consistency: risotto’s consistency should be such that it spreads in the bowl without being soupy. This means that you’ll probably need more liquid that you think. Having said that I like it a little but more dense – adding cheese helps achieve that, but if it becomes too stodgy you’ll need to add extra stock. Think creamy like a good mac and cheese. 2. Liquids: for each cup of rice, you’ll need about 4-5 cups liquid. This should consist of 2-3 cups stock, 1 cup white wine and 1/2 cup milk or cream for a delicious flavour lift. You can use lactose-free milk or goat’s milk if you prefer. The stock should be warm so that the risotto cooks at a fairly steady temperature. Add liquids at the rate of about 1/2 cup at a time and stir through, cooking until mostly absorbed or evaporated. Repeat until the rice is cooked to just al dente and the creamy consistency has been achieved. About 20 minutes all up. 3. 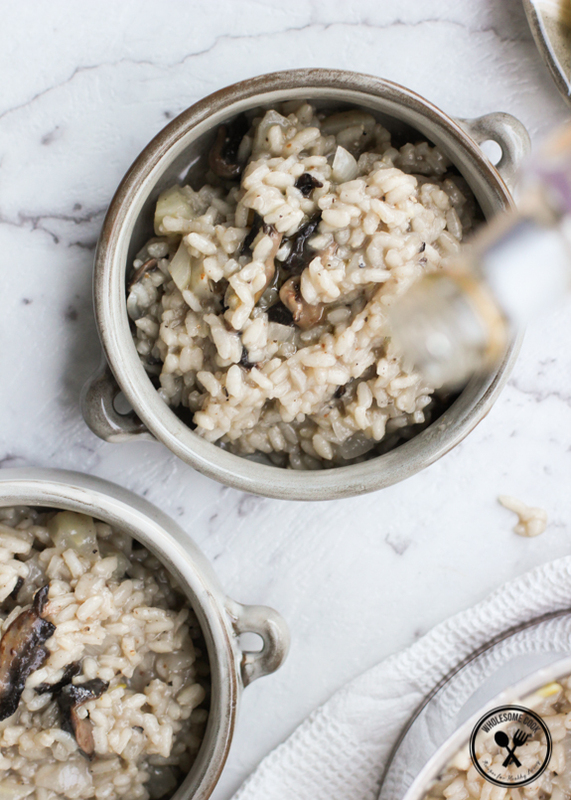 Toasting: off the rice in the pan with oil and sautéed onion is an important step to a tasty and texturally-sound risotto. It helps coat the grains in fat to then slowly break down the starches in them. 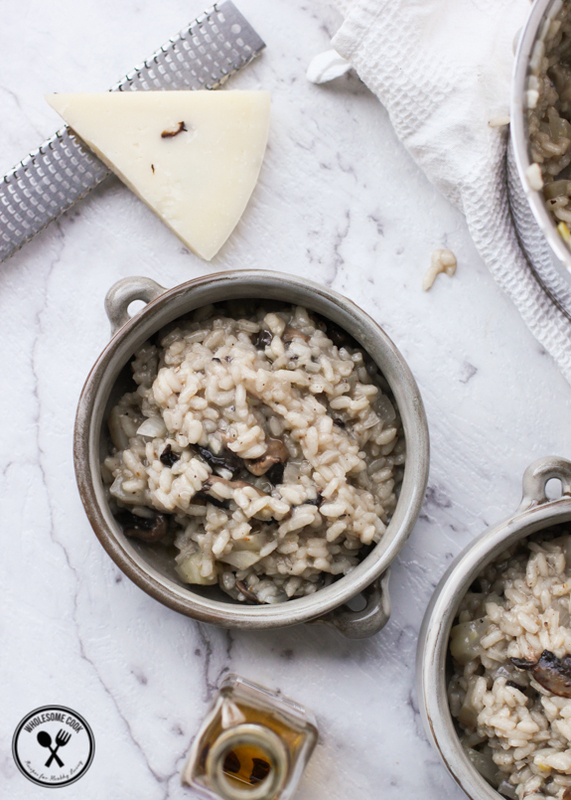 In the following risotto recipe, I've used both truffle cheese and truffle oil. You can simply use plain pecorino if you are having trouble finding the truffled variety. The flavour will be slightly less intense, but none the less noticeable. Chicken or vegetable stocks are best used here. 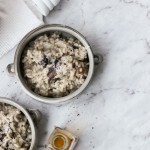 For a vegan version use fat and milk substitutions listed and microplane a couple of macadamia nuts over the risotto for that "parmesan" look or use nutritional yeast flakes. Be prepared for a lot of stirring, with love. Heat oil in a medium saucepan over medium heat until bubbling. Add onion and sliced fennel bulb. Season with salt and pepper and stir-fry until translucent. Add mushrooms and cook for a further 2 minutes, stirring. Add rice to the pan cook for a minute, stirring. Now, working in stages, add 1/2 cup of stock to the suacepan and stir to deglaze it. Bring the rice and stock to a boil then reduce heat to low. Alternate stock with wine until all liquid has been absorbed and the rice is almost cooked. Add cream and simmer for a further 2-3 minutes. Add more stock, 1/2 cup at a time, if the risotto feels heavy and stodgy. Transfer risotto into serving bowls and drizzle with truffle oil. Sprinkle with freshly grated pecorino cheese (I like and recommend lots). Your photos in this post are absolutely stunning Martyna! Looking at them feels like I’m transported into a posh restaurant. And fittingly so, now that we are on the topic of truffles. Absolutely adore the aroma also. What esle have you been using the oil in? We normally just use it for dipping bread. Wow, gorgeous shots. Simple dish of rice and stock elevated by the mighty truffle. Perfect. Thanks for the risotto making tips as well. Very handy. Yuuuuum! I’m with the others, amazing shots. And a great wintery recipe with that oil! 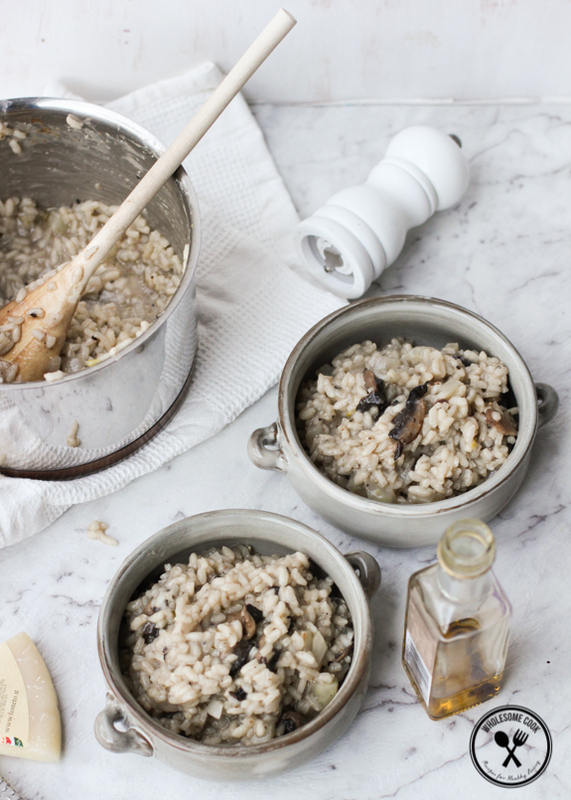 Your risotto looks perfect – not too wet and not gluggy. I ordered risotto at a restaurant last week and I swear I could have eaten it with a knife and fork. Love that you made this dish dairy free and I bet with that truffle oil you do not miss the cheese one bit. I love you you made even light brown food look amazing. I know that risotto can be so difficult to photograph as it does not like to be in a dish for more than a minute before eaten or maybe I can’t stand to wait more than a minute to eat it. Either way, gorgeous! This looks so good. I remember you posted beetroot risotto earlier. I have to try out these two recipes sometime soon. I’ve never had a risotto before, but it sounds delicious. And the recipe you gave looks pretty simple, I feel that I could do it. However, I’m not a big fan of mushrooms. Are there any other vegetables you’d suggest for this recipe? Hi Petunia, you could use peas or green beans, but only add them toward the end so that they remain bright and al dente. Baby spinach would work well, mixed in as well.